Many facets of human life across what used to be the British Empire, but is now the Commonwealth, contain links with the Legion of Frontiersmen. Here we investigate the greatest of two extremes of human life, from one Frontiersman who was hanged to the other extreme of units of Frontiersmen who guarded Kings and Princes. We have described previously how the Frontiersmen in Canada were involved in the guarding of King George VI in 1939, but this was far from a solitary occasion. We will begin with a Frontiersman convicted of murder and conclude with an upbeat story of Frontiersmen as Royal bodyguards. It is well known by followers of the Legion of Frontiersmen that Erskine Childers was on the early Executive Council of the Legion and his famous book “The Riddle of the Sands” was influential in the thoughts of the Legion’s Maritime Division. We also know that he was executed in later years for treason. Because of this, his name was omitted from any publicised list of famous Frontiersmen, lists that have been known to include imaginative claims of famous men who never were Frontiersmen. We can add another definite name of a Frontiersman of the same era who was executed by the State, and whose name was certainly never publicised in any Legion recruiting leaflet or press release. Look carefully at the photograph here of Frederick Seddon. This is a photo to be easily found, but who has looked closely at it before? It is just possible to make out on his left lapel a small button badge. 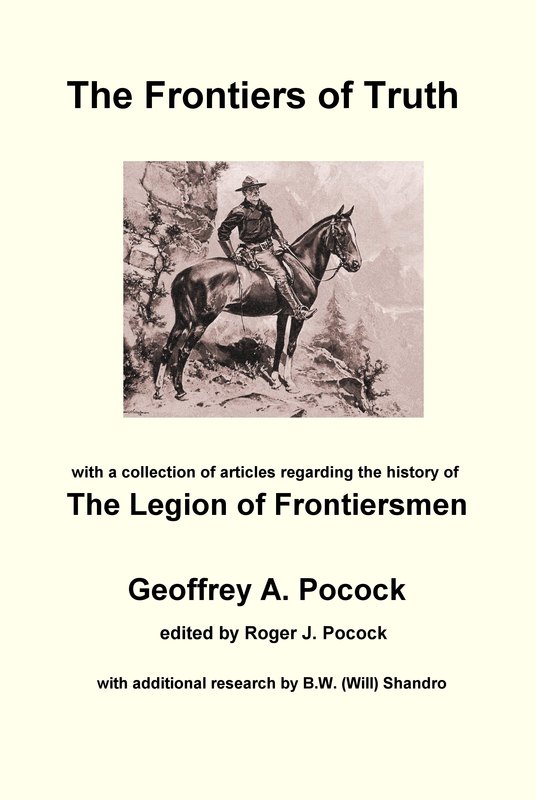 Yes, it is indeed the membership button badge of the Legion of Frontiersmen. On the internet and in many books you will find the story of how Seddon poisoned his lodger Eliza Mary Barrow with arsenic. Seddon was obsessed with money, as was Eliza Barrow, who did not trust banks. Miss Barrow died on 14th September 1911 and Seddon had her buried quickly in an unnamed plot. In November her body was exhumed, and on 15th March 1912 Seddon and his wife stood trial. 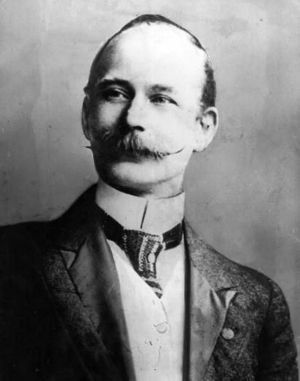 Seddon was found guilty and hanged on 18th April 1912. It has to be a mystery as to how Seddon was allowed to join the Legion when he had apparently never worked abroad. We can only assume it must have been another of his believed lies. The only reason he must have wished to join the Legion has to be that he considered that the contacts he would make could be of financial benefit to him. 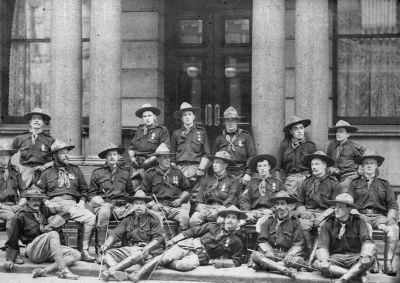 He is seen here in a group photograph of London Frontiersmen second from left in the front row. He also featured in the programme of a 1909 sports day organised by the London Frontiersmen in the grounds of Holland House, which shows him taking part in the 100 yards race. What happened to his numbered button badge after his execution? Perhaps it finished up in someone’s black museum collection? We do not know. Group photograph of London Frontiersmen showing Seddon second from left in the front row. Photo reproduced courtesy John Carnaby. 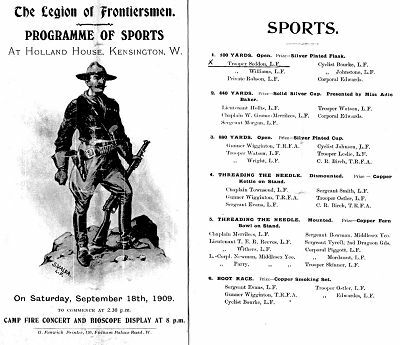 Part of programme from Legion sports at Holland House 1909. Seddon is shown listed as taking part in the 100 yards race. Reproduced courtesy of Jerry Watkins, CMOLOF. The Prince of Wales inspecting the Legion of Frontiersmen at Hull. There is no need to list any more Frontiersmen who found themselves in trouble with the law. With an organisation numbering its membership, perhaps optimistically, at anything up to 40,000 in its 110 year history, there were bound to be some rogues. In fact, the early Frontiersmen were expected to have lived part of their lives on the wilder frontiers of the world, where law and order as we know it was often in short supply. What can be said about the Frontiersmen is that in early days they stood for King and Empire. This then became modified into Queen and Country Frontiersmen. They have always been royalists. Although never chronicled officially, the existence of such a royalist organisation would have been in some way a comfort to the British Royal family, especially in the 1920s. Nearly a century on, we may scoff at the great concerns of the time but, following the Russian revolution, there were fears in the ruling classes about the spread of bolshevism – communism. 3 What organisation could be trusted implicitly never to be infiltrated by bolsheviks? The Legion of Frontiersmen has always been strictly non-political, but this King and Empire organisation would never attract revolutionaries. The unofficial use of the Legion by British Royalty cannot be illustrated any better than on Remembrance Day, Friday November 11th 1927. We have already seen that the Frontiersmen had been a secondary Guard of Honour to the highly popular Prince of Wales on his return to London in 1925 from a world tour. 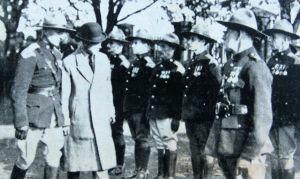 4 Two years earlier, in July of 1923 London region Frontiersmen were detailed to be Guard of Honour to King George V and Queen Mary when the King officially opened King George V Park at Southfields. The King made a point of shaking hands with Legion Captain Herrington, in command of the Frontiersmen, and asking him all about the Legion and its strength. 5 In May 1926, Colonel Vickers Dunfee, the Colonel Commandant of the City of London Police Reserve penned a personal letter of thanks to Cdt Burchardt-Ashton for the support of the Legion during the General Strike: …you had won golden opinions from the Regular Police…may we long be able to rely of the support of your Legion. 6 The Frontiersmen’s reliability and loyalty were unquestionable. One eventful night in 1927 saw the Frontiersmen take on possibly the most extraordinary duty for such an organisation of volunteers that was not under Government control. The Festival of Remembrance at the Albert Hall was not yet a British Legion event, but was sponsored by the “Daily Express”. There was scarcely a family in the land that had not been affected by the First War, which had only finished nine years previously. Because of the vast numbers who wished to attend, a second and just as emotional festival was held outside in Hyde Park opposite Knightsbridge Barracks. After the Festival had ended there followed an extraordinary scene. A torchlight procession headed by the Prince of Wales and accompanied by ten bands was formed up outside the Albert Hall and marched along Knightsbridge. Swelled by numbers from the Hyde Park Festival it made its way along Buckingham Palace Road to Whitehall and the Cenotaph where a simple ceremony took place. The Prince did not finally leave until a quarter to midnight. Although the Festival of Remembrance had been arranged by the “Daily Express”, the procession was organised by the British Legion. Accompanying the Prince was Winston Churchill who, in spite of one of the often-repeated Legion myths, never joined the Frontiersmen but was certainly well aware of them and their principles. You might think that the Prince was guarded by some burly policemen or maybe a few armed special bodyguards in case some disturbed person with a grudge or a violent political motive decided to attack the Prince. This was 1927, a simpler world, and one united in grief for the fallen. Who then acted as the Prince’s personal bodyguard along the route of the procession? The Prince, who was bareheaded,…was escorted by a score of the Legion of Frontiersmen. Yes, what you read is true, the Legion of Frontiersmen formed the personal bodyguard of the Prince of Wales. A surge from the crowd set the Legionaries rippling like a twitching chain, but with grins and jests, with pushing and cajoling, a way for the Prince and the men was made through the narrows of the gates. Who could have been trusted more completely than the Legion of Frontiersmen, all of whom that day would have given their lives for the heir to the throne of the British Empire? As could be seen by the medals they bore, they had all in previous conflicts put their lives on line for King and Country. That helps to explain why there are numerous photos of the sons of King George V inspecting the Frontiersmen and talking to them. 1 For biographical details of the life of “Count” Johnston Noad see the unpublished paper: The Frontiers of Truth , Geoffrey A Pocock, June 2013, lodged at Peel Special Collections Library, University of Alberta. This entry was posted in City of London Police Reserve, Daily Express Festival of Remembrance, Latest Topic, Legion of Frontiersmen and tagged Alec Knowles-Fitton, Col. Vickers Dunfee, Erskine Childers, Frederick Seddon, Johnston-Noad, Prince of Wales, Thomas John Elliott. Bookmark the permalink.